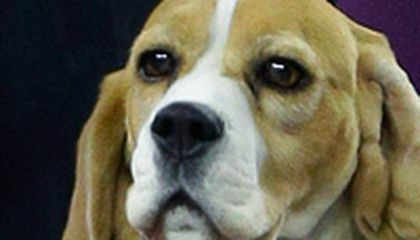 At 4, Miss P is a grand-niece of Uno in 2008, the immensely popular hound barked and bayed his way to becoming the only previous beagle to win at the nation's most prominent dog show. A quiet one, too, and not your normal, everyday, vocal beagle, as most owners can attest. 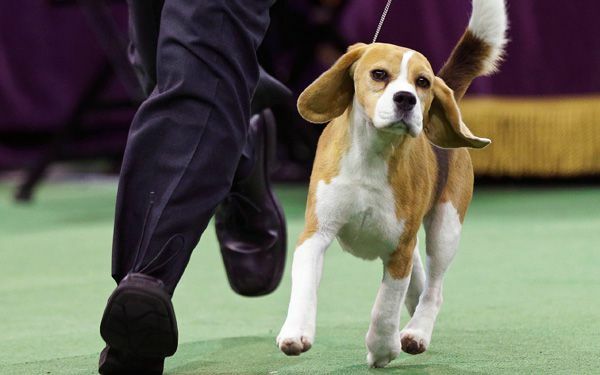 Only a half-hour after her win did the 15-inch Miss P, a breed known as "big beagles," start to make a noise, and that was only because her people were giving her treats. A Skye terrier came in second this time and a standard poodle, a shih tzu owned by Patty Hearst and an English springer spaniel also made it to the last ring. There's no prize money for winning Westminster although there's prestige forever in the dog circles, plus the possibility of lucrative breeding rights. The reason for why the author emphasized the statement is because the beagle was probably really sweet and a very nice dog. The Dog was happy. Beagles are a vocal breed of dogs, usually bark a lot but it seems the owner really trained her well to obey . Really great to see dogs being praised this way and not shown abuse or neglect by some of their owners. The dog looks really pretty, but I am sure it is not the best dog in the world just because it won a dog show. That type of question is definitely opinionated. I think that this beagle is amazing. As a dog person myself, I know that dogs bark a lot, especially beagles. I've never before seen a beagle that is quiet. I love dog's. I'm so proud for this dog winning first at Westminster. I looked up the top dog breeds in America. I looked that it was the boxer. Boxer's are really smart dogs. Beagles are like gentlemen and a good hunting dog. Miss P won that because she was very handsome. The thing about dog's is they are really playful. i say no because a course it still things out their to be amazed over. Plus their are so many dogs in the world what make one dog so special. its cool to see that the owner has trained the dog so good. also this type of dog is suppose to bark a lot and be a loud dog. I think that they are a one of a kind they have special talents and very very good abilitys to be outside and a good hunting dogs . I don't have a beagle personally but I think they are some cute animals. I wouldn't say they are the cutest animal but they are on of them.